I'm trying to write up a bit of a comprehensive guide here on how to gather collectables for Miner and Botanist. If you see any information that seems wrong, don't hesitate to let me know, as I'm no expert. First you need to find the node with the given item. Which is a given. Most of the time it's an Unspoiled node, on a timer, as a result your amount of items to collect will vary depending if it's one or not, due to taking an extra hit in uncovering the item first. Remember what 'slot' it is, the item is always in the same spot, saving you the need to 'search' for it. 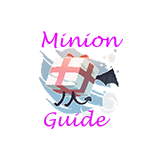 Then when the item is uncovered, instead of collecting it as usual, make sure the ability Collector's Glove is on. You'll know if it's written Collectable at the top of the item window. This will open a new screen that looks a bit like crafting, but doesn't work the same. First there's Wear. If that amount goes higher than the maximum (usually 30), you'll get nothing, plain and simple your chances become 0% of getting an item. So the idea is to raise the Rarity as high as possible within a certain amount of hits. Each of the ability give a certain amount of "Wear", but also a certain amount of "Rarity". The game here is to balance the Wear and the Rarity, with the abilities you have. They are divided in two categories in general : Appraisal, and Buffs. Appraisal are will take one 'move' out of the node, and increase the Wear/Rarity accordingly. By move, it means that it removes one possible item to collect. 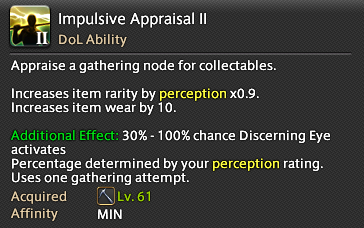 Say you're at a gathering node with 4 attempts, you use 3 Appraisals, you can only collect 1 item afterwards. Impusilve Appraisal (lv53) is where RNG works in. It only gives 0.9x Rarity, 10 Wear, but has a chance to give the Discerning Eye buff. More on that later. The upgraded version gives a variable, and admittedly improved chances of Discerning Eye happening, so effectively it should replace it entirely. Aka, when you gain Impulsive Appraisal II, you should be using it in all rotations instead of the older verison. Instinctual Appraisal (lv51) is 0.8-1.5x Rarity for 10 Wear. While this isn't part of the current rotations due to RNG, the reduced wear since Stormblood helps make it a more viable voice (used to be 15 wear). So statistically speaking there should be more chances of getting higher than a 1.0x result, so it might get more use in the future. Discerning Eye (lv50) uses 200 GP and increases the Rarity by 50% more depending on the next Appraisal. Utmost Caution (lv51) reduces the next Appraisal by 5 Wear. Straightforward, also useful if you need to get an extra hit in without going over wear. Single Mind (lv57) is a great ability that makes it that you don't use up an attempt on your next Appraisal. If you use the early example of 4 gathering attempts, 3 appraisal + 1 collectable result, then you get 2 collectables using Single Mind. That's nice and all, but how do I use them? This depends first on how much Rarity you increase per Methodical Appraisal. So you may want to waste one shot at any colelctable to figure that number out, although remember it may vary with the level of the item you want to collect. There is no magic calculator that I know of, but there are basic rotations that will hit certain target numbers. First you should try to get 600 GP, that's the magic number for the most part. That gives you 3 buffs usage in most cases. If you can get 650 GP, even better, you can use a Sharp Vision or Field Mastery buff to bring your chances of success of collecting said item closer to 100%. Nothing like whiffing after working your collectability up after all. Now look at the Collectable Level of the time you want. Say that you want an item that requires at least 240 Collectable rating, and you hit for 80 Rarity, then all you need to do is use Methodical Appraisal 3 times and you're done. If you're a little short, then you may need to use a Discerning Eye to increase the Rarity of one of your hit. The thing is, it depends on what you're aiming for as well : More items, or higher rarity. If you're aiming for a single item with the highest rarity possible, then you'll be using Utmost Caution to increase the amount of times you can use Appraisal. But in general it gives more rewards (EXP and Scrips) to aim for the bare minimum Rarity and get more items out of it (1 item at 240k EXP or 2 items at 200k, easy to figure out). This obviously depends on if you hit the minimum with only Methodical Appraisal and Discerning Eye. You may need to not use Single Mind if you can't get over the minimum with it, and use more Discerning Eye instead. The advantage of using Single Mind is that extra item you get (2 instead of 1), so use that one if you can. This used to be known as the 'blue scrip' rotation, as it was the simplest for the lowest scrip. Now that Blue scrips are gone, this is more referred to as the 'basic' or 'standard' rotation. There are two variations to it as well. The Simplified uses less steps overall, both Simplified and Upgraded will offer you a +1 yield. Simplified uses RNG though, so Upgraded should be the best one to use as long as you hit the minimum of 115 on your Methodical Appraisal. I've been using Simplified, it works great! If you can't get it with only Methodical Appraisal, then you need to rely on RNG more with the rotations. This is actually more confusing than it really is. The logic here is that you save GP by not have to use Discerning Eye whenever it happens by usage of Impulsive Appraisal (or II). Which means you rely on RNG. 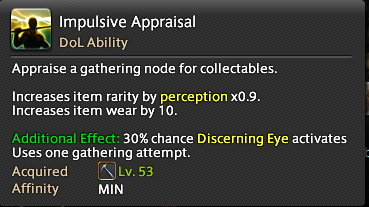 Whenever Discerning Eye procs, you use Single Mind + Methodical Appraisal instead, which allows you to get an extra item instead and maximize your Collectability progress. So the minimum you should be getting with this rotation is 1 item, and 3 if you're lucky with RNG and getting all Discerning Eyes. Better than none, isn't it? And if Impulsive Scrips Rotation still doesn't bring you high enough, try the Utmost Caution Rotation instead. If that's still isn't enough, you're probably in need of better gear at that point. The same logic applies than the Impulsive Rotation. If you get some Discerning Eye Procs, it means you get more items out of it at the end. Utmost Caution is used here to sneak in an extra hit to reach the minimum Rarity requirement. This is based on the information I found, there may be other methods to hit even higher amounts of Rarity, but as I said before, it's more efficient to get more items than higher Rarity. The only reason you'd use those if if you cannot get the minimum Rarity any other way. And then you probably would get only a single item out of it. There is one exception to this of course, Zhloe's turn ins. Since they are limited to 6 turn-ins weekly, you want to hit the Collectability that gives you the highest reward, even if you have to get only 1 item per harvest. Collectables of course! Look at what Rowena is asking for the day. At level 60 its usually only an item or two, normally one of them is found on every level 60 node (try to find those with Gathering Attempts +2 that appear at random). As you grow in level she will offer more options that are worth more EXP normally. I don't have a specific rotation for those, but try to find yourself a path that you can hit several within 12 hours. The unspoiled ones usually are worth more EXP and Scrips, so chase those down, and use the normal nodes to fill the time in between. Use this handy list to find locations, time and slot of items to gather. These are the highest yielding items currently in the game. You can hit all 6 nodes comfortably by using Cordials in between, as they are all spaced by 2 hours. More than enough time to recover GP and move to the required area. 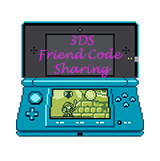 These are already on the Google Doc list, but relisted so you know which 6 to focus on. This is of course if you have both Botanist and Miner available. You may be able to hit this rotation as soon as level 66, depending on when Rowena starts requesting them daily. Any change you can post screenshots of certain parts? Like the crafting-like window that pops up, the Glove thing, etc? I'm nowhere near this level of gathering, but visuals usually help get a grasp of things over a bunch of text trying to explain it. Sounds like a plan, I'll add to it tonight. http://www.ffxiv-gathering.com/30.php usually use these rotations for blue/red scrips/counterfoils. For flare, http://www.aleczan.com/FFXIVARR/wp-content/uploads/2015/09/Alec_Collectable_Rotations2.jpg - red/blue scrip collectable rotation picture. Fae the idea is that Cel's making his own guide. Doesn't mean he can't pull inspiration from random stuff like those! Thanks for the info nonetheless, I'll look into it later. Flare meant adding the pictures to the actual first post of course, just to make things clear. 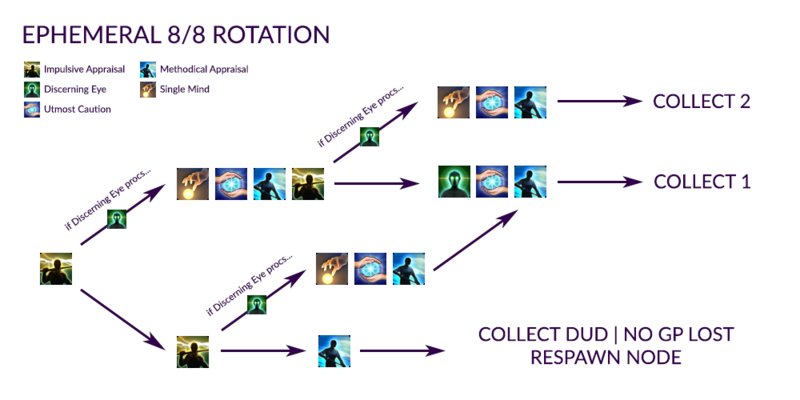 I used these rotations myself, those were listed at 3.3 patch rotations on Reddit, I figure the same logic would apply to leveling up as well, depending on your Gathering stats. EDIT : Just took a look. The thing is that those rotations assume that you have 600+ in all gathering stats and GP, aka you got the max results possible as there's a cap in place. I made this guide to EXPLAIN the HOW the abilities work together, rather than simply feed rotations. 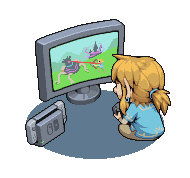 Plus while leveling up your stats won't be that high just yet. Aka, this guide is a good starting point for leveling up. But this is good info, I'll look into it and amend to it for Epheremeal nodes, and double check if my rotations here are the same ones, the thing with online games is that what is the optimal rotation only is optimal until a better one is found. It's not collectibles, but one more important thing is the rotation at Ephemeral Nodes for aethersand, which is different from the scrip rotation. 'Respawn node' means go tap two nodes from two different groups, which will reset the node. It's also useful to have a schedule handy to know where to go next. Updated with new rotations, hopefully will help people during Stormblood leveling! Page created in 0.579 seconds with 50 queries.